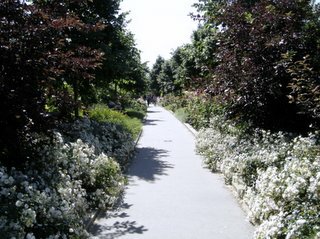 The Promenade Plantee, the Planted Promenade, is just that, a promenade with plants. And, it's elevated. 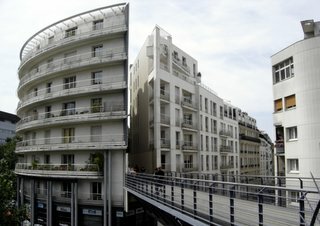 In 1859, a railroad track for freight trains was constructed, a portion of which was a viaduct, connecting the station at Place de la Bastille, now removed and replaced with the Opéra Bastille, to the station in Saint-Maur, 14 kilometers southeast of Paris, where the RER line A now runs. 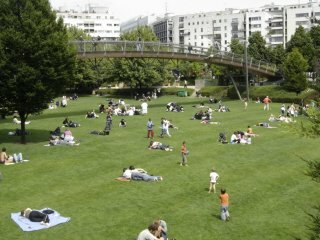 In the early 1990s, the City of Paris and SEMAEST, Société dEconomie Mixte dAménagement de lEst Parisien, transformed this weed infested railroad track into the Promenade Plantee and Viaduct des Arts. 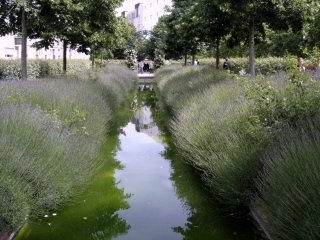 The designers of the Promenade Plantee were landscape architect Jacques Vergely and architect Philippe Mathieux. The abandoned viaduct Daumesnil, crumbling and scheduled to be demolished, has been transformed into the Viaduct des Arts. The original 70 red brick arches of the 1.5 kilometer viaduct have been restored, renovated and enclosed with glass. 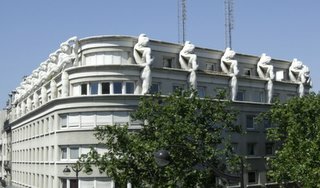 It now houses arts and crafts workshops, galleries, furniture showrooms, a restaurant and a café. The original idea was for the artists and crafts-people to work in view of passer-bys. For several reasons, this proved impractical, though there are some artisans who can be viewed working. 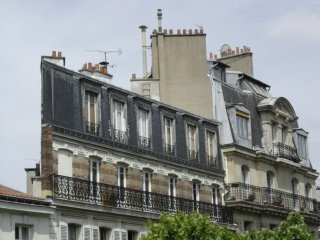 Among the 45 studios of the Viaduct des Arts are cabinet-makers, sculptors, ceramicists, tapestry-makers, violin and flute makers, restorers of furniture and art objects and interior designers. The Viaduct des Arts was open to the public in 1998 though it wasn't completely finished until 2000. 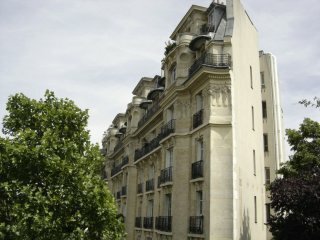 It has since become a contemporary Parisian landmark. 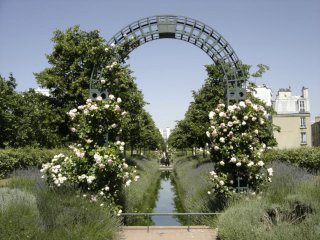 The Promenade Plantee, also known as the Coulée Vert, the Green Flow, extends 4.5 kilometers, running almost the entire length of the 12th arrondissement, from the Périphérique on the eastern end to the Place de la Bastille on the western end, with only the last couple hundred yards being taken up by the Opéra Bastille. 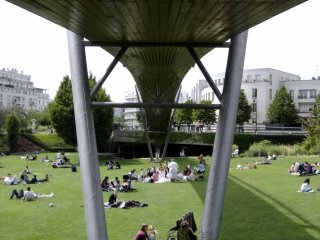 The elevated portion of the Promenade Plantee runs from the Opéra Bastille to Jardin de Reuilly, a distance of 1.5 kilometers. 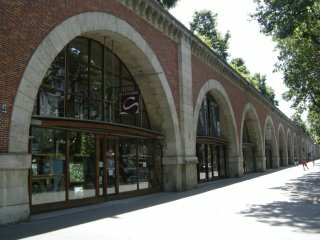 Beneath this section of the Promenade is the Viaduct des Arts. 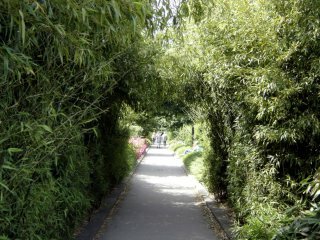 This elevated part of the Promenade Plantee is a narrow walkway, occasionally opening to wider, wooden-planked areas when it crosses over a street. Generally, a stairway down to street level (or up to Promenade level) will be found here. There is an elevator, which occasionally works, located on Voie AA/12 just west of Boulevard Diderot. The elevated level offers interesting perspectives of the variety of buildings which the Promenade Plantee passes. The Promenade passes closely by old and new apartment buildings, and once seems to go right through the building. The mass of plant-life that borders and sometimes encroaches the already narrow trail can give the impression of being momentarily lost on a forest trail. Then, sporadically, there are breaks in the herbage, offering views of the surrounding city. 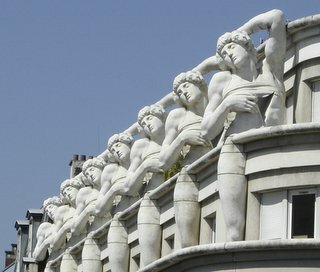 One of the more unusual sights is that of 12 reproductions of Michaelangelo's "The Dying Slave" which adorn, of all places, the top of the Police Station of the 12th arrondissement. The original statue of "The Dying Slave" by Michelangelo is found in the Louvre Museum. Among the plants that are found along this walk are hundreds of rose bushes, hardy shrubs, acanthus, triton, lavender, bamboo, ivies and vines and wisteria and cherry trees, maples, lime trees and many other varieties. 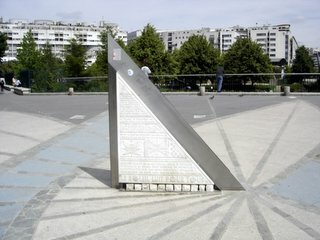 The walkway goes through an area of modern-styled apartment buildings, then it becomes a metal bridge which opens up onto a plaza with a four-foot high floor sundial. Here is the Jardin de Reuilly, the Reuilly Garden. The entrance sign to the Jardin de Reuilly states that the Garden is situated near the ancient Chateau de Reuilly which was a vacation house for the Merovingian Kings. 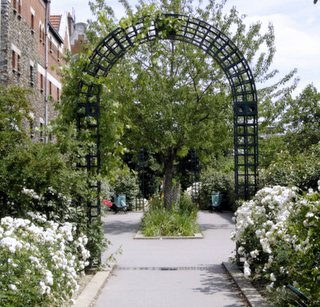 More recently, the Jardin de Reuilly occupies the site of an old freight station. 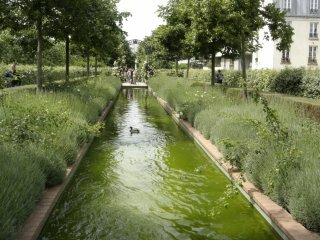 Created in 1992, the Garden covers 1,500 square meters. It includes a large circular central lawn, a series of beautifully planted terraces and walkways, a children's playground, statues, a rose garden and an open-air café. The main entrance to the Garden on Avenue Daumesnil is furnished with ramps making the Garden accessible for wheel-chairs and baby-strollers. 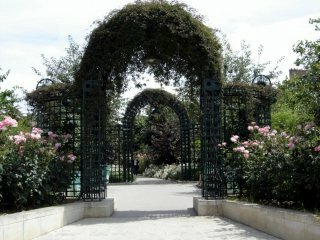 One can either enjoy walking directly through the Garden, or traverse it by an arched, lightweight footbridge made of metal and wood that spans the central lawn of Jardin de Reuilly. It is the most elevated portion of this walk. East of the Jardin de Reuilly is the Allée Vivaldi which basically runs through an office building plaza. Beyond this Allée, the Promenade splits into a pedestrian path and a bike lane and enters a gaping underpass that has five individual rock waterfalls within it. Once through this underpass the Promenade Plantée completely changes. What was an elevated walkway has become a sunken walkway where both sides of the Promenade Plantee are bordered by 30-foot tall outward sloping hillsides. For those who don't like heights, here is where to begin. The walls are covered with foliage as are the borders along the walkway. It is a very interesting sensation to be suddenly below street level after having been above it for the past 1.5 kilometers. It is a lovely, cool walkway, sometimes under a canopy of tree boughs. It passes through two old railroad tunnels which have ivy dangling down overhead from the arched entrances of the tunnels. For those who may be missing the upper elevations, there are observation towers to climb along this part of the trail. The Promenade Plantee then splits at Avenue Général Michel Bizot. The trail to the right leads to Square Charles Péguy which has a children's playground, ping-pong tables and a series of small multi-leveled ponds that cascade into one another. It's a quiet and comfortable small park. The trail to the left at Avenue General Michel Bizot continues to the Périphérique (the freeway which encircles Paris) where there are ramping paths that branch left and right to residential streets. Continuing on straight ahead is a metal spiral staircase that goes up to Boulevard Carnot. The Bois de Vincennes is a few blocks to the south. Two streets to the north is Porte de Vincennes. A couple streets to the left (west) on Porte de Vincennes is the Metro station Porte de Vincennes on line #1. The closing hours for the Promenade Plantee and its adjoining parks vary throughout the year. In January it's 5:30 p.m.; in February it's 6 p.m.; from March-April 15 it's 9 p.m., from April 16-May 15 it's 9:30 p.m.; in September it's 8 p.m.; from October-December it's 6:30 p.m.